Homeowners need to be very careful when hiring a foundation contractor or structural contractor to perform foundation or structural repairs to their home. This type of work requires both specialized knowledge and experience. 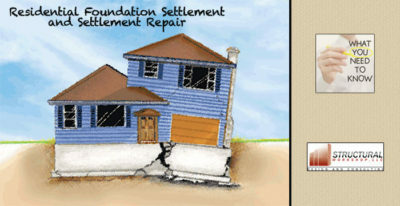 Your foundation is holding up the entire house and structural elements are usually holding up at least a portion of the house. When performing work in these areas, it is EXTREMELY IMPORTANT that the foundation contractor takes adequate steps to ensure the safety of the rest of the structure. In almost every case, loads will have to be temporarily transferred somewhere else so the affected area can be repaired. 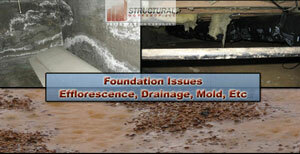 This can be 50% or more of the work the contractor needs to perform. Hiring only the low bidder or a contractor inexperienced in this type of work can lead to a repaired foundation but no living room above it. Contractors need to follow strict shoring and sequencing guidelines to ensure that the rest of the structure remains safe while working. Ideally, the engineering plans should specify the shoring and sequencing routine and an Engineer should oversee the work. On larger projects, if a good contractor realizes he is over his head, he may hire his own Engineer just to design the shoring. 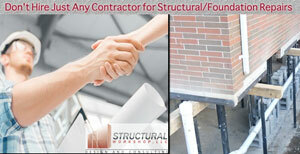 Below are a few tips to keep in mind when selecting a contractor to make structural or foundation repairs to your home. Pre-Qualify(See Below) all of your bidders before they submit bids. This way, you can choose the lowest bids from among qualified contractors. Be very suspicious of prices that are much lower than others. 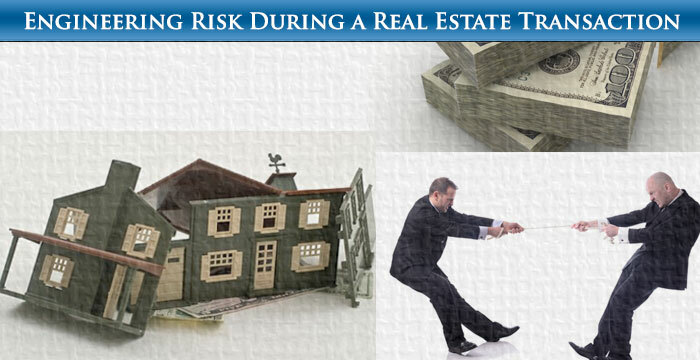 Discuss exactly “how” the contractor intends to perform the work with all the bidders. The low bidder may be forgetting something. Look for contractors with an Engineering background. Many Engineers have migrated to construction and many Engineering School graduates who have not pursued a career in Engineering are in the construction field. In addition to checking references, insurances, etc. and all the normal things that should be done when hiring ANY contractor, make sure that the contractor has experience in the type of work that you need done. Verify that these types of projects were completed successfully. Consider hiring an Engineer to oversee the construction and make visits to the site at certain milestones to ensure the contractor is using acceptable techniques. Start your search with contractors who specifically advertise themselves as “Foundation Contractor” or “Structural Contractor”. While advertising isn’t always truthful it is better to start you search with “Foundation Contractor” as opposed to calling six general contractors and finding out they all do only kitchens and bathrooms.